TAMPA, Fla. — An Oklahoma zookeeper at an exotic animal park has been charged in a murder-for-hire scheme alleging he tried to hire someone to kill the CEO of Big Cat Rescue in Tampa, federal prosecutors announced on Friday. 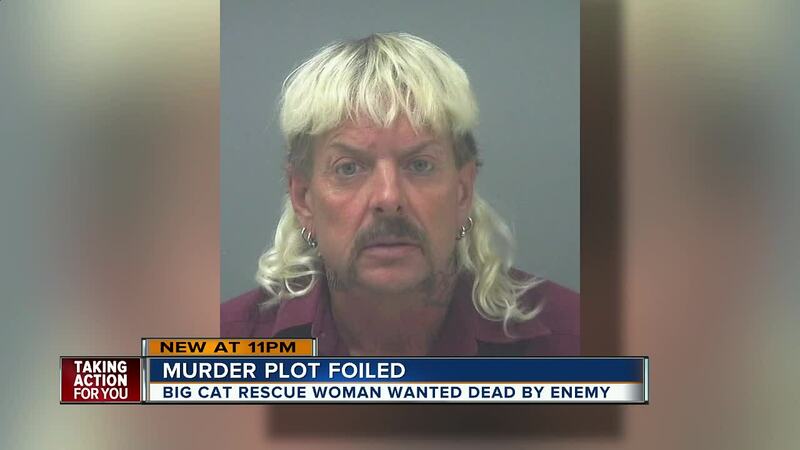 Joseph Maldonado-Passage, 55, also known as “Joe Exotic,” was indicted on two counts of hiring a person to commit murder after he reportedly tried to hire two different people to murder Carole Baskin. Baskin took to Facebook tonight, expressing her relief that "Joe Exotic" was behind bars. Maldonado ran, in our view, one of the most notorious cub petting roadside zoos in the country in Wynnewood, OK. Years ago he also operated a traveling exhibit that would bring cubs to malls throughout the Midwest and Southwest. When Big Cat Rescue educated the malls about the miserable life this created for the cubs and the malls started cancelling Maldonado’s traveling exhibit, Maldonado retaliated by renaming his traveling show “Big Cat Rescue Entertainment” in order to confuse the public into thinking the show was operated by Big Cat Rescue. In 2011 Big Cat Rescue sued for violations of its intellectual property rights and in 2013 was granted a consent judgment for over $1 million. Litigation to collect on the judgment has been ongoing since then in Oklahoma. We are ENORMOUSLY grateful to the U.S. Fish & Wildlife Service, the FBI, the US Attorney's Office for the Western District of Oklahoma and the U.S. Marshall's Service for the many months of incredibly hard work that went into this investigation and arrest. According to the indictment, Maldonado-Passage gave an unnamed person $3,000 to travel from Oklahoma to South Carolina and then to Florida to carry out the murder. He allegedly agreed to pay thousands more after the deed, officials say. In the second count, Maldonado-Passage repeatedly asked a second unnamed person to murder Baskin in exchange for money. However, that person was actually an undercover FBI agent who met with Maldonado-Passage in December 2017. If found guilty Maldonado-Passage could be imprisoned on each count up to ten years. He could also face a fine of up to $250,000 per count, officials say.